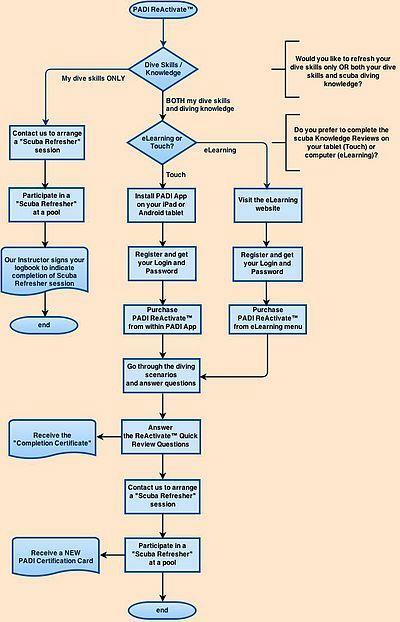 Re Activate your PADI diving certificate Reactivate! Have not dived for a while or you’re not completely sure of yourself underwater? The PADI Reactivate ™ program is the perfect way to refresh your knowledge and skills of the PADI Open Water Diver course. Is it just a few essentials or you want to repeat the base again ..
Reactivate is adaptable to your needs: you repeat at ease on your tablet, iPad or computer theory and then go diving with a PADI Pro. Do you have an dive trip planned in the coming up and just realized you haven’t been diving in a while? The PADI ReActivate program is fully personalized and prescriptive, meaning you’ll only have to cover the areas where your skills and knowledge need refreshing. You’ll be able to review important concepts on your computer (ReActivate Online) or mobile phone and tablet devices (ReActivate Touch) and work through topics at your own pace. You will interact with dive scenarios and make decisions that test your understanding of important dive safety concepts, dive planning essentials and problem management before going diving with a PADI Professional who will review a few basic safety skills before diving deeper into any skills you specifically want to recap and what you need to know only! Just like riding a bike, the skills will come right back to you again. 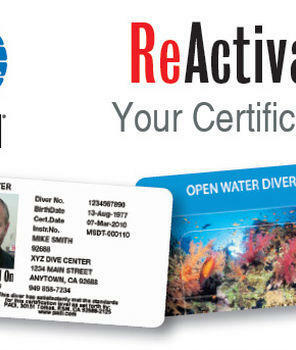 What’s even better is that once you’ve completed both the knowledge and in-water skill refreshers, you’ll even get a replacement certification card with your ReActivate date. Easy Divers Cyprus is the only dive centre in Cyprus to offer Safe Diving, this unique opportunity to dive with FREE Nitrox and Use Dive Computers.